Syed Shuja Qadri, RKD Goel, Jagjeet Singh, Surendra Kumar Ahluwalia, Rambha Pathak, Humaira Bashir. Background: Substance abuse among children has become an issue of concern throughout the world. Increasing substance abuse and its impact on physical and psychosocial health is a worldwide public health concern affecting the early youth and subsequently the whole life of the individuals. Particularly disturbing fact is that the age of initiation of abuse is progressively falling. To plan effective interventions, it is essential to have information on the extent and type of substance abuse among school children and their attitude towards its control. Aims & Objective: To find out the prevalence and pattern of substance abuse among school children and the associated risk factors. Material and Methods: A descriptive cross-sectional survey was conducted among students (13-19 years) studying in classes 7th-12th in rural and urban areas of district Ambala, using the Self-Administered WHO Model Core Questionnaire. Stratified random sampling technique was used to select the respondents. A total of 1500 students studying in various government and private schools were taken for the study purpose. Results: Overall prevalence of substance abuse was 60.0% for ever users and 34.93% for regular users. Substance abuse was more among male urban students belonging to nuclear families (p<0.001). Among ever users, alcohol (44.49%) was the most common substance abused while tobacco (14.42%) was mostly consumed by regular users. Substance abuse was more in age group of 17-19 years. Overall 42% were using more than one drug combination. Conclusion: Prevalence of substance use among school children in Northern India is high and causes significant physical and psychosocial problems in this population. A large proportion of those using drugs reported serious adverse effects, raising the necessity of targeted interventions to reduce the risk of subsequent substance dependence and other deleterious consequences. Key words: Substance abuse, Prevalence, Ever users, Regular users. 1. Saah T. The evolutionary origins and significance of drug addiction. Harm Reduct. J. 2005; 2: 8. 2. Substance Abuse, Drugs and Addictions: Guidebook. Aide Medical International, UNHCR, 09 September 2009. 3. Ray R. National survey on extent, pattern and trends of drug abuse in India. Ministry of Social Justice and Empowerment and United nations office on drug and crime regional office for South Asia, 2004. 4. Patel DR, Greydanus DE. Substance Abuse: a Paediatric Concern. Indian J. Pediatr. 1999; 66:557-67. 5. United Nations office on drugs and crime .project title: national survey on extent, patterns and trends of drug abuse in India. 2003. 6. Juyal R, R. Bansal, S. Kishore , K.S. Negi , R. Chandra , J. Semwal. Substance use among intercollege students in District Dehradun. Indian J. Community Med. October-December, 2006; 31(4):252-254. 7. Ningombam S, Hutin Y, Murhekar MV. Prevalence and pattern of substance use among the higher secondary school students of Imphal, Manipur, India. Natl. Med. J. India. 2011 Jan-Feb; 24(1):11-5. 8. Abdulmalik J, Omigbodun O, Beida O, Adedokun B. Psychoactive substance use among children in informal religious schools (Almajiris) in northern Nigeria. Ment. Health Relig.Cult.2009; 12(6):527-542. 9. Saxena V, Saxena Y, Kishore G, Kumar P. A study on substance abuse among school going male adolescents of Doiwala Block, District Dehradun. Indian J. Public Health. 2010; 54(4):197-200. 10. Sarangi L, Acharya H P and Panigrahi O P. Substance Abuse among adolescents in Urban Slums of Sambalpur. Indian J. Community Med. 2008 October; 33(4): 265&#8211;267. 11. Singh V, Pal HR, Mehta M, Dwivedi SN, Kapil U. Pattern of tobacco use among school children in National Capital Territory (NCT). Indian J. Pediatr. 2007 Nov; 74 (11):1013-20. 12. Kapil U, Goindi G, Singh V, Kaur S, Singh P. Consumption of Tobacco, Alcohol and Betel Leaf among school children in Delhi, Indian J. Pediatr. November 2005; 72:993. 13. Patel S, Shah R, Pati H, Gandhi P, Bhatt S, Venkur GK. Awareness and use of substances among high school students. Indian J. Psychiatry. April 1998; Vol. 40 Supplement. 14. Ahmadi J and Hasani M. Prevalence of substance use among Iranian high school students. Behaviors. March 2003; 28(2):375-379. 15. Ray R. Current extent and pattern of Drug abuse. In; Drug Demand Reduction report. New Delhi; UNDCP Regional Office for South East Asia 1998:5-36. 16. Verma VK, Dang R. Non-medical use of drugs amongst school and college students. Indian J. Psychiatry 1979; 2:228-234. 17. Mohan D, Thomas MG, Sethi HS, Prabhu GG . Prevalence and patterns of drug use among high-school students: a replicated study. Bull Narc. 1979 Jul-Dec; 31(3-4):77-86. 18. Yisa IO, Lawoyin TO, Fatiregun AA, Emelumadu OF . Pattern of substance use among senior students of command secondary schools in Ibadan, Nigeria. Department of Epidemiology, Medical statistics and environmental Health, Faculty of Public Health, College of Medicine, University of Ibadan, Ibadan, Nigeria. Niger J. Med. 2009 JanMar; 18 (1): 98-102. 19. Singh H, Maharaj HD, Shipp M. Pattern of substance abuse among secondary school students in Trinidad and Tobago. Community Services, Ministry of Health, Trinidad, West Indies. Public Health. 1991 Nov; 105(6):435-41. 20. Ferigolo M, Barbosa FS, Arbo E, Malysz AS, Stein AT, Barros HM. Drug use prevalence at FEBEM, Porto Alegre. Brasil. Rev. Bras. Psiquiatr. 2004 Mar; 26(1):10-6. 21. Amiri ZM, Shakib AJ, Moosavi AK Prevalence and risk factors of ecstasy use among college students in Astara, Islamic Republic of Iran Department of Community Medicine, School of Medicine, Guilan University of Medical Sciences, Rasht, Islamic Republic of Iran. East Mediterr. Health J. 2009 SepOct; 15(5):1192-200. 22. Kapoor SK, Anand K, Kumar G. Prevalence of tobacco use among school and college going adolescents of Haryana. Indian J. Pediatr. 1995 July-Aug; 62(4):461-6. 23. Tsering D, Pal R. Role of family and peers in initiation and continuation of substance use. Indian J. Psychol. Med.2009; 31(1):30-34. 24. Narain R, Sardana S, Sanjay Gupta S, Sehga A. 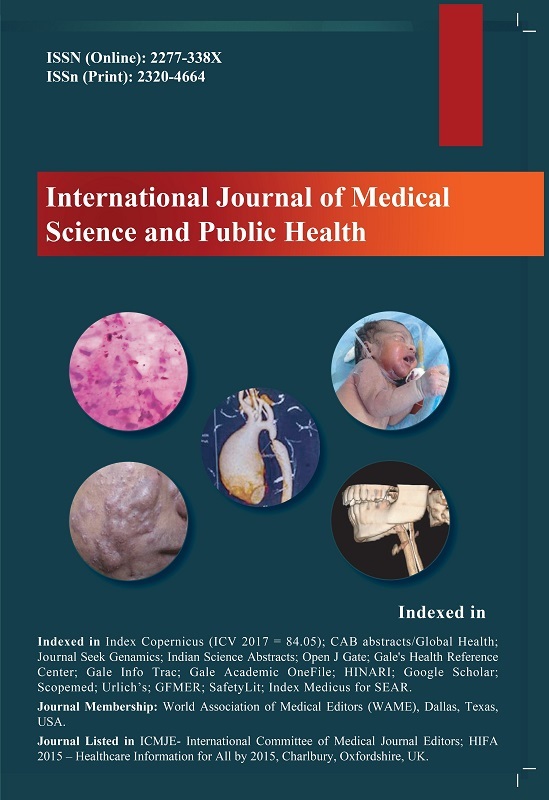 Age at initiation & prevalence of tobacco use among school children in Noida, India: A cross-sectional questionnaire based survey. Indian J. Med. Res. March 2011; 133:300-30. 25. Muttapppallymyalil J, Sreedharan, B Divakaran. Smokeless tobacco consumption among school children. Indian J. Cancer. 2010; 47(5):19-23. 26. Arditti J, Spadari M, Camprasse MA, Dalecky C, Bourdon JH. Abuse of licit and illicit psychoactive substances in children and teenagers in the PACA Region (Southeastern France).Therapie.2004NovDec; 59(6):595-7. 27. Poulin C, Elliott D. Department of Community Health and Epidemiology. Dalhousie University. Student Drug Use Survey in the Alantic Provinces 2007. Atlantic Technical Report.